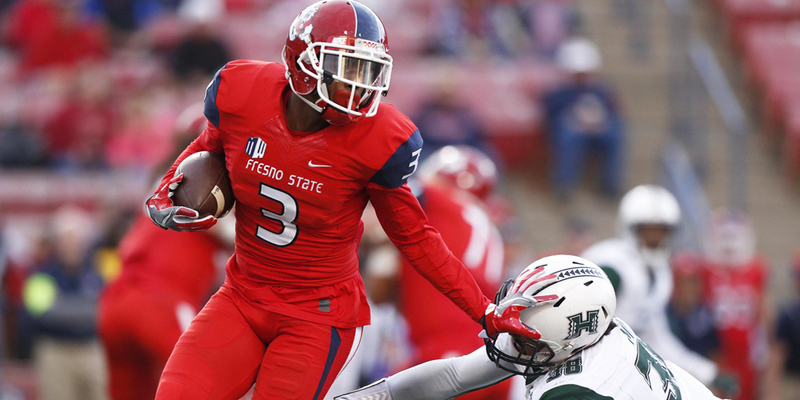 Why should fantasy owners be excited by former Fresno State wide receiver KeeSean Johnson? Well, it’s not his 2019 NFL scouting combine numbers for sure. He underperformed in the 40-yard dash (4.61), the vertical jump (32.5), and the broad jump (112”). Overall via PlayerProfiler.com, he ranked in the 34th percentile in speed score (89.8), 4th percentile in burst score (109.5) and 17th percentile in agility score (9.74). But all is not lost for the Fresno State product. Two metrics that bode well for Johnson’s future production include his college dominator rating (70th percentile) and his breakout age of 19.9 (68th percentile). Via Pro Football Focus (PFF) Johnson ranked sixth overall in quarterback rating when targeted, and sixth overall in yards per route run (3.05) with a minimum 100 targets in the 2019 draft class. He also excelled in the slot generating the fifth highest yards/route run (4.13) and a 144.4 passer rating. He also ranked top-ten in total deep pass receptions of 20 or more (15) and total deep pass yards (541). So from a college production standpoint, Johnson stacks up will the best that the 2019 Draft Class has to offer. During his final season at Fresno State, Johnson tied University of Massachusetts wide receiver Andy Isabella for the most games (10) with at least 85 receiving yards of all wide receivers in the NCAA. Over his last three seasons, Johnson ranked third in that same metric (17) behind again only Isabella (19) and second-year pro-James Washington (19). Over the last three collegiate seasons, Johnson ranks third overall in total receptions (238). During his senior season, Johnson became the program’s all-time leader in both career receptions (275) and career receiving yards (3,463) during the season. Also from 2016-2018, Johnson played in 31 games where he had at least five receptions. No other player had more than 26 games with at least five receptions (Isabella). In the same date range, Johnson also played in 32 games where he had at least 50 receiving yards. No other player had more than 27 games with at least 50 receiving yards (N’Keal Harry/Isabella). Johnson also went to the same high school as former Bulldog and current Green Bay Packers wide receiver Davante Adams, who left Fresno State as the school’s all-time leader in receptions and touchdown catches following the 2013 season. The last fun fact comes via Dane Brugler on Twitter: Johnson was born six months after Keyshawn Johnson was drafted No. 1 overall in 1996, which is partly how he got his name. Johnson’s main strength is the ability to catch the football. Seems obvious for a receiver to have that strength, but you’d be surprised. He has some big, strong hands. He catches everything thrown his way. Of his 102 catchable targets in 2018, he dropped just seven of them (1 out of 14.5 catchable targets). His drop rate via PFF ranked 12th best out of all receivers that had at least 110 targets in 2018. He is also great after the catch, ranking 11th overall in total yards after catch and 18th in yards after catch/reception out of the 2019 Draft Class. Also ranked top-ten in avoided tackles after the catch. He’s also extremely well-rounded as he is a receiver can play in the slot and win over the middle but can move outside and be efficient in the deep passing game. Weaknesses for Johnson surround mostly his athleticism. His combine metrics were subpar, and MockDraftable.com compares him to guys that include: Allen Hurns, Anthony Johnson, Mario Manningham and a bunch of no-name players. Adam Levitan from DraftKings wrote up an article about minimum player thresholds from a metric standpoint and they do not bode well for Johnson. These are based on combine results for each wide receiver who have finished in the top ten of fantasy points per game over the past five seasons. How did Johnson stack up? Not good. Of the seven main metrics that include: height, weight, 40-yard dash, vertical jump, broad jump, 3-cone, and 20-yard shuttle, Johnson reach the minimum thresholds on just height and weight. He finished outside the minimum thresholds in all of the tests outside the 20-yard shuttle (which he did not test in). Johnson’s bread and butter is dominating the short and the middle of the field with the occasion to also win deep on the outside. Of his total 128 targets in 2018, 55 (42%) came between 0-10 yards to the line of scrimmage converting on 45 of those 55 targets (82%). He’s also been heavily used in the screen game behind or at the line of scrimmage. 19 targets total in that ranged converting 18 of them for receptions. But in addition to that, he’s also shown that he can at times he can play outside. Specifically, on the left outside, he saw 20 targets in 2018 10+ yards downfield, converting 12 of them for receptions and three for touchdowns. Johnson does not just fit as a typical “X” wide receiver, as a slot receiver or even as a flanker. But from that versatility standpoint that is why he is an attractive player for a lot of different teams; he can play multiple roles in an offense. So instead of a team drafting Player X to player their X role, and Player Y to player their Y role, Johnson could potentially fill both roles. He will have to show grit and toughness though to go over the middle of the field against NFL teams unlike what he does in this clip below where he “alligator arms” a catchable ball to avoid taking a big hit. Factors we also are looking at when considering wide receiver prospects entering the NFL as always are college dominator rating and breakout age. According to FantasyData.com which records college fantasy statistics from 2018, he was the wide receiver eight overall in fantasy points scored. Overall PFF graded Johnson as their 10th overall receiver (min 100 targets). The real takeaway from analyzing Johnson is that he’s probably a better actual football player than he is as an actual athlete. His production in college shows that he is indeed good at football, but perhaps his potential upside is limited by his subpar athleticism. But in the end, NFL teams are building football teams, not athletic super squads so there is a place in the NFL for Johnson. Though he may never be a number one on an NFL offense, Johnson has the real opportunity to be a nice complimentary piece in an NFL offense.